Two decades ago, corruption was the problem that no one talked about. “You couldn’t use the words ‘bribery’ or ‘corruption'” at institutions like the World Bank, said Michael Hershman, who helped found Transparency International in 1993. Thankfully, all that has changed: corruption is now widely recognized as one of the biggest stumbling blocks to economic development around the world — a rot that drains economies and governments, sabotages aid programs, and erodes trust in public and private institutions. 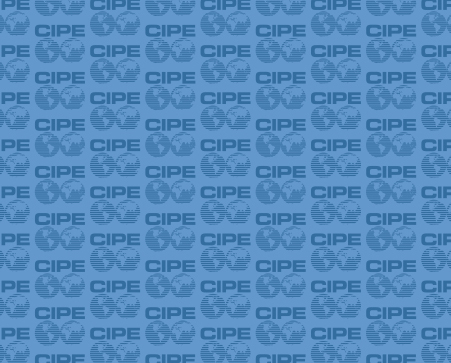 This new attitude can be attributed, in large part, to the work of Transparency and its individual country chapters — a history which Hershman shared with CIPE staff at a brownbag discussion this week. As an investigator, Hershman had worked at USAID and later for foreign governments and large companies through his consultancy, The Fairfax Group, tracing the path of dirty money and setting up compliance programs. He saw first-hand the damage that corrupt officials were doing to their countries and societies, and how money intended to help the poor was being diverted to line the pockets of the well-connected. So when Kamal Hossain, a prominent Bangladeshi lawyer he had recently worked with to track down stolen public funds, told him about the idea for what would become Transparency International, he readily signed on as a co-founder. Corruption thrives in the shadows, which is why, from the beginning, Transparency aimed to shed light on corrupt practices wherever they existed. The Corruption Perceptions Index, launched two years after the organization’s founding, is Transparency’s most recognizable product and has become a crucial tool for understanding public corruption around the world. There’s still plenty of work to be done. But at least it’s a problem we can talk about openly. Jon Custer is Social Media / Communications Coordinator at CIPE.